A cold snowy night at Angus Manor tonight. They say it’s gonna be quite the snow storm and coupled with some frigid weather – negative 15 degrees Fahrenheit by Thursday morning. Private Ainsley and yours truly just returned safely from my nightly patrol. Here you see me, wearing my high tech camouflage winter wear. Though I gotta wonder what the boys in Scottie Logistics are thinking, going with the orange and blue camo pattern. 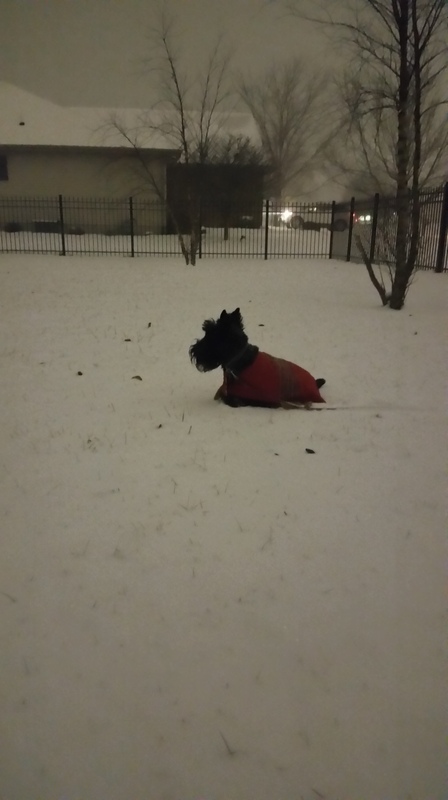 Don’t know what color the snow is over at the Homeland of Scotland, but here in the frontiers of Illinois, it comes in one color – white. So sleep well under your warm blanket of freedom, and know that Ainsley is out there on that wall. Myself – well, I’ll be snuggled right next to you in that warm blanket of freedom. 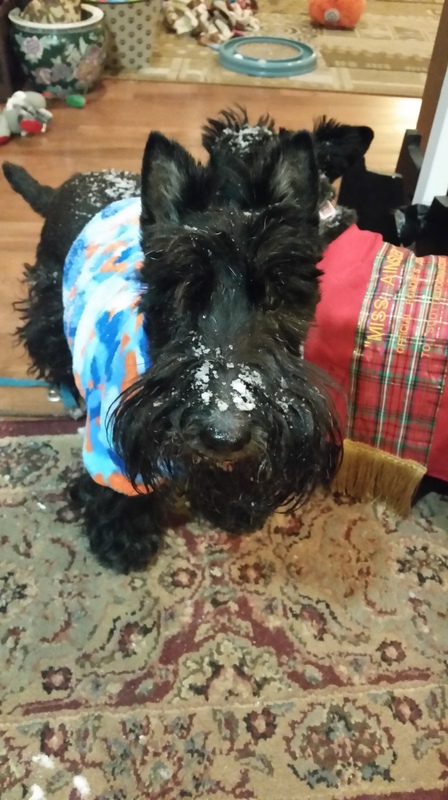 It’s too dang cold for Senior Master Sergeants in this Scottie’s Army! but who will be up there on that wall? Angus and Ainsley…time to come to Florida. i’ve always wanted to see the ocean! Bitter cold here, too. The girls are not fond of the sweaters, but mom wins in this weather. Well….sure looks like Ainsley is well prepared for the night watch….so we guess as Oowner and Boss you get all the fringe benifits of staying under the blankie all night! Oh the cost of being top dog! Oh Angus, you are so brave. I do hope some day we will get to meet. Wednesday’s high here in Quincy, Il will be 1 degree & that night -7!!! Snowing here also but may not get more than an inch for now. Take care & tell Ainsley not to extend that patrol too long. Otherwise you will be reporting on Ainsley the Pupsickle! Angus Manor is in Peru, Illinois. But I am petitioning the State to allow me to incorporate Angus Manor, Angus Fala Worldwide, and my new proposed theme park, Angusland, into its own jurisdiction – AngusFalaVille. Dat are some crazy cold.